Sampling the delights of Chester's Baytea restaurant. Chester is quickly becoming a foodies haven – with an array of restaurants serving cuisines from all the corners of the world. And most recently, the city has welcomed a new tasty face to our beautiful Tudor rows. fresh, homemade Arabic food. Inspired by the Middle East and North Africa, and influenced by Europe and Asia, this family-run restaurant brings exciting flavours from across the world into the heart of Chester. Earlier this month, I was given the true experience of the ‘new kid on the block’ as I dined there one Saturday evening. Amna, one of the founders of the restaurant, met me and took me to a little table upstairs. The interior is simple – stripped back leaving the focus purely on the food. But, what did I think…? accompanied by warm homemade Arabic bread. Colour and fragrance delighted my senses. With my mouth watering, I first dug into the hummus – a classic, flavoured with tahini, lemon, garlic and cumin. Satisfied, but eager for more, I moved on to some of the more ‘unfamiliar’ dishes in front of me. I still crave the creamy, light Middle Eastern soft cheese called Labneh – drizzled in olive oil, this was a dish that wasn’t going to last very long! It was the perfect companion to my bread. Another dish which left me in a lustful daydream was Baba Ghannouj – and not just because of its name – the zingy lemon and hints of garlic coupled with the aubergine was addictive! Also making up the mezza board was fragrant falafel in a crumb and a carrot and olive dip. Oh, and don’t let the latter fool you into being a boring salad dish – no, instead carrots have been condensed into a thick dip with little crunchy pieces adding texture to each mouthful, flavoured with garlic and chili and finished with a sprinkling of chopped olives – simple? Perhaps, slighlty. Delicious? Most definitely. Teased with starters, I awaited my next course of Lahem Meshwi – translated as marinated lamb with their choice of spices accompanied with Arabic bread, rice, or chips. Having been extremely impressed with the doughy goodness, I couldn’t resist another serving of bread! Succulent chunks of lamb burst with flavour with each bite. I used the bread to plate up the meat and the lightly dressed salad, creating a little kebab type meal. combinations of spices and herbs. And just when I thought things couldn’t get better, Amna brought out a final dish. 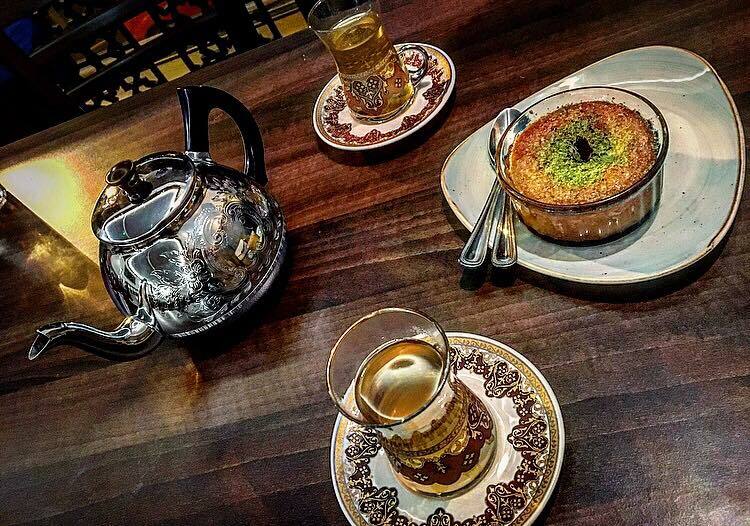 A sweet, sticky Semolina cake, accompanied by a pot of Arabic green tea, because ‘in an Arabic home, we always finish with tea’ – how wonderful! A gold syrup soaked sponge with a soft, creamy middle sprinkled with chopped pistachios. I must say I wasn’t too hungry after consuming my weekly carb intake with the first two courses of their amazing Arabic bread – but I had to at least try it. But one spoonful quickly became one bowl full. It’s the perfect finisher for anyone with a sweet tooth. All of this washed down with a cup of fresh tea served from the most beautiful pot! new. Amna and her family wanted to share this love of food with other people – and they noticed that Chester was missing a traditional Arabic restaurant. Combining the recipes that have both been passed down through the family and learnt from their travels, with Amna’s love of flavoured tea leafs, Baytea was created. Baytea is situated on Foregate Street, and open Monday to Sunday from 12pm-10pm. If you’re wandering round Chester and fancy some Eastern flavours, this is the place! Find out more by visiting their website and as always, we’d love to hear from your own experiences!